I’m excited to invite you to our 2018 Gala on April 21, 2018 at Stepping Stones Museum for Children in Norwalk. More details, including information about purchasing tickets, ad sales, and underwriting ArtLink teachers is available here. This year, we are pleased to honor Rhonda Kiest, CEO and President of Stepping Stones Museum for Children, and the museum itself, as our Global Partner Honoree. The Global Partner award recognizes the outstanding contributions of an individual or organization that inspires global awareness among our youth. Rhonda and Stepping Stones are long time partners of Creative Connections. For more than two decades, we have partnered on art displays, ArtLink programming, Professional Development, the International Young Performers Tour, and so much more. Rhonda and Stepping Stones could not be a more fitting honoree for this prestigious award. 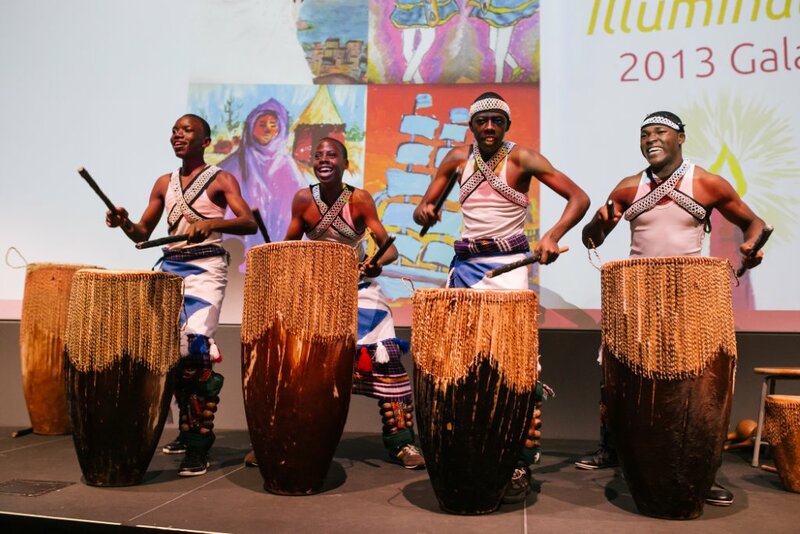 We will be featuring our International Young Performers Troupe from Uganda, Abantu Mu Buntu, read more about them below. I hope that you’ll join me on the 21st of April for this year’s Annual Gala. 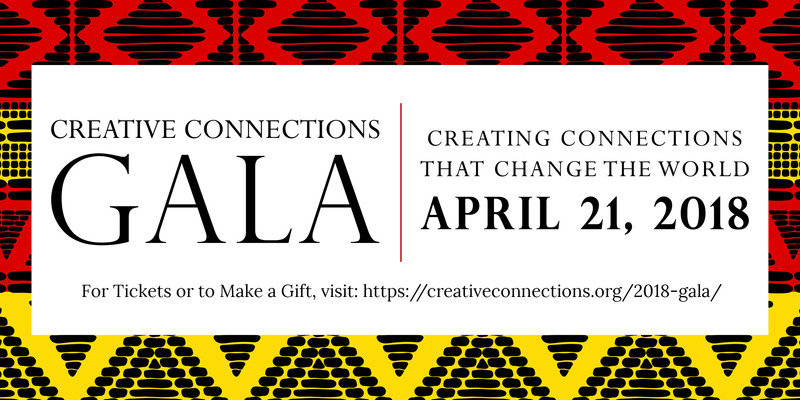 If you’re unable to make it, please consider making a gift to Creative Connections to help fund our work in schools both state-side, and around the world. 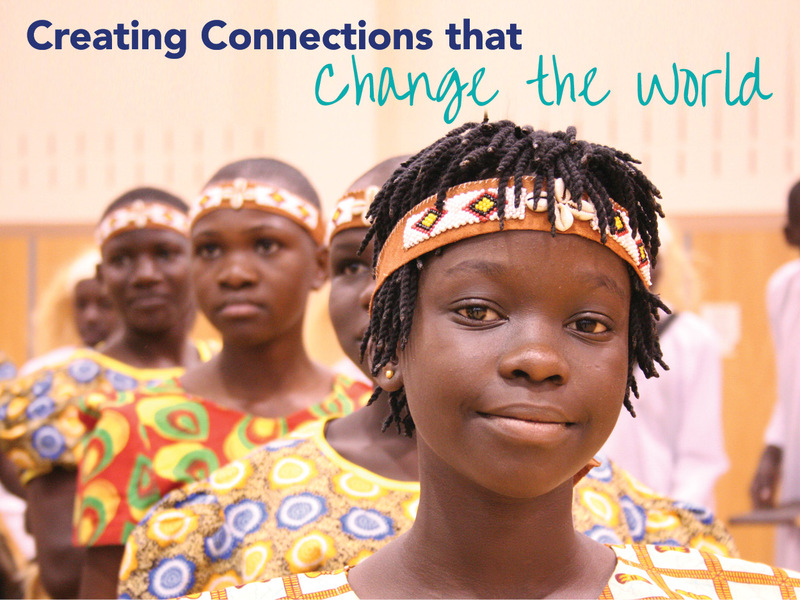 For more information on Creative Connections, visit CreativeConnections.org, call 203-803-4376, or email Polly Loughran at ploughran@creativeconnections.org. Abantu Mu Buntu is comprised of student performers from Tender Talents School in Uganda. Tender Talents provides a rich exposure and training in the arts while preparing its students academically for college entrance. Many of Tender Talent’s children are from Northern Uganda, a war torn region where recently, child soldiers were more prevalent then students. Half of the students attending the school are offered full or substantial scholarships. The students will give performances and workshops to fifteen area schools from April 19 – May 4 2019. And will be perform at our 2018 Gala on April 21st. Learn more about Abantu Mu Buntu. We are excited to share that Mrs. Joanna Zachos, a third grade teacher at St. Mary School in Bethel, CT, is the recipient of the "Foundations in Education Innovation and Leadership Grant". These grants promote excellence in school leadership, teaching and learning for educators in the Diocese of Bridgeport by funding innovation in classroom teaching and providing support for continuing education and leadership formation. Ms. Zachos will use this grant to enroll her students in Creative Connections’ RainForest ArtLink program. 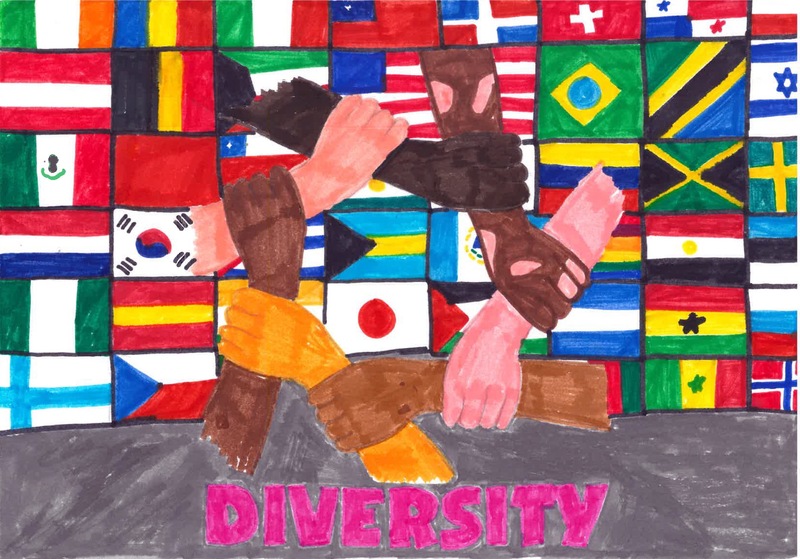 Students from Mrs. Zachos’ class will be partnered with a class in Guatemala, and will create and exchange artwork about their lives and cultures. When The Patch asked Mrs. Zachos about the program, she said, "This program is all about building bridges, about ensuring that our students become globally aware, and about integration of curriculum and infusion of the arts. I am so honored to receive this grant, and so happy for our class and our school!" Rainforest ArtLink Celebrates 10 Years! This year marks the 10th anniversary of RainForest ArtLink (RFAL), our unique exchange that links students in the US — many of whom are learning about rainforests in their science and social studies classes — with their peers actually living in the rainforest regions of Guatemala, and new this year, in the Brazilian Amazon. Miguel Barreto, RFAL’s Program Director since its inception in 2008, has collaborated with Rainforest Alliance and met and trained teachers and administrators both here in the USA and in Latin America to ensure that their students use the exchange to understand better the vital connections between environment and culture. We sat down with Miguel for a short Q&A. Q: Why does Creative Connections run RainForest ArtLink? A: To break down stereotypes about what students in the USA think about what the rainforest is. Students learn about the ecology of the rainforest, but they never reflect on how the people in the rainforest live, or even what type of people live there. People know about animals or medicine. But when you say students, they say, “Oh I didn’t know there were students!" Q: What do you hope students take out of RainForest ArtLink? A: My hope is that the students don’t reinforce preconceived ideas. For example, I don’t want people from the United States thinking that Guatemala or Brazil is all poor. I want students to smile and be excited about connecting with others as equals. Q: What about the students in Brazil or Guatemala? A: I want to open the opportunity for them to see a different perspective around the world. They love connecting with students in the United States. 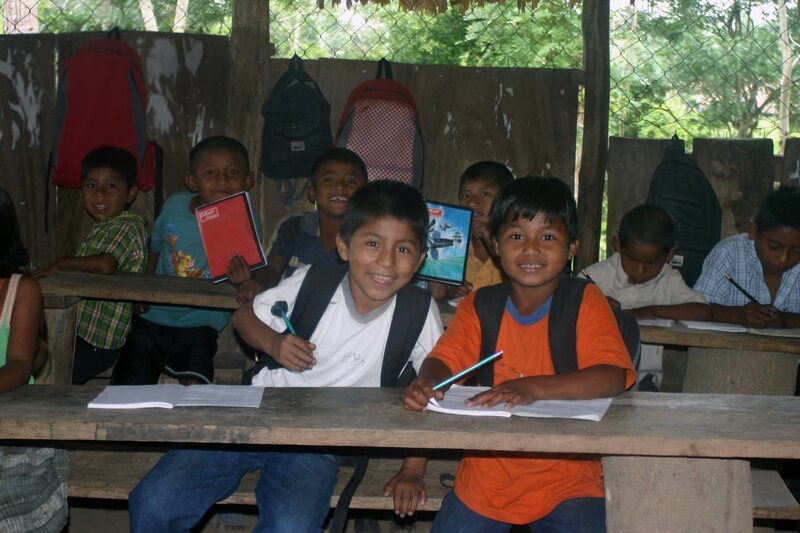 In the rainforest, there are not that many opportunities for students to get to that level of higher education. Q: What else do you want to share? A: One of the most amazing about things this program is the buy-in we have from the educators who live there. For example, with the tireless help of Rainforest Alliance’s local coordinator (just retired), Ramón Zetina, our program has earned the blessing and support of the Regional Secretary of Education in Guatemala, as well as dedicated teachers living in 40 different communities in and around the rainforest. And we have a waiting list of additional teachers waiting to enroll their classes. If you haven’t seen our Traditions Revealed video, please make sure to watch this short film. Traditions Revealed, is an inspiring art exhibit we recently displayed at Silvermine Arts Center in New Canaan. Students who have participated in ArtLink over the last 25 years created the pieces featured in the video. "My piece shows many different traditions, customs, and interactions that happen on a daily basis when in the United States or in my home state in Connecticut. I’m showing the value of diversity, which is important because it shows how different the USA can be from other countries. My family and I are from El Salvador, we speak Spanish, and we’re all 100% hispanic. Over the last month, we’ve seen an outpouring of support for our 60-in-60 Creating Connections campaign. Thanks to you, we’re more than halfway to our goal! If you haven’t already, please consider making a donation to help us raise $35,000 to create and sustain connections between US-based students and their peers in Guatemala, the Brazilian Amazon, and Uganda. Gifts as little as $10 go a long way! Learn more about these programs and make a donation today at creativeconnections.org/60-in-60-connections/. To bring ArtLink or RainForest ArtLink to your classroom or after-school program, apply here.